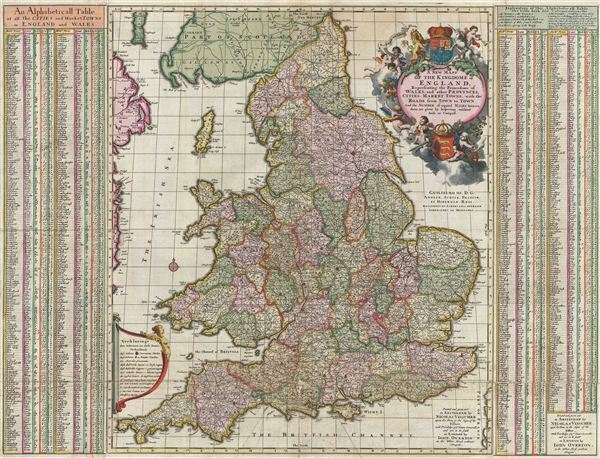 A fine c. 1695 old color example of the deluxe John Overton edition of Visscher's stunning map of england and Wales. Constructed on the model established by the John Adams map of 1679, Anglia Totius Tabula, Visscher's map covers all of england and Whales as well as adjacent parts of Scotland and Ireland. Towns, cities, and counties are identified and mileage between towns noted via a network of intersecting lines overlaying the map. A bold and flamboyant title cartouche appears in the upper right quadrant features numerous putti as well as the royal crests of england and Wales. To the right and left of the map proper explanatory tables, a rare addition that appears only in scarce 'deluxe' editions of this map, detail market schedules for towns and cities throughout the region - no doubt an invaluable reference for anyone researching 17th century english country trade. A dedication to William III (Guilielmo III) appears below the title cartouche, allowing us to date the map with some precision. earlier editions bear an inscription to the unpopular Catholic king of england, James II. Around 1685 attention turned to William III of Orange, who earlier had married Mary II (James' daughter), putting himself in line for the British throne. William had the distinct advantage of being protestant and consequently more appealing to the anti-Catholic British. William was formally invited to invade england by group of bishops known as the 'Immortal Seven.' Around this time, 1688, editions of this map began appearing without any dedication - reflecting the uncertainty of the time. On November 5th, 1688, William arrived in Britain with an army of approximately 11,000 foot and 4,000 horse soldiers, proclaiming 'the liberties of england and the Protestant religion I will maintain.' Faced with overwhelming odds, James II fled england for Catholic France, thus by default abdicating the throne in favor of his daughter, Mary II, wife of William III. William thus became King of england and Mary, Queen. They would rule jointly as William and Mary. The next edition of this map, 1695, reflects the dedication to William III, a natural choice for, as Prince of Orange, William III was also sovereign over Holland, Visscher's home country. The dedication moreover identifies this map as the fourth state of five. This map is consequently a joint publication embracing both Dutch and British cartographic elements. While printed in Amsterdam, the map is in english and was co-published by Visscher's english partner John Overton of 'Whitehorse without Newgate.' It appeared both independently as a broadside and in various composite atlases compiled in the late 17th century. John Overton (1640 - 1708) was an English cartographer and map publisher active in the late 16th and early 17th century. He shop, a noted on many of his maps, was at the sign of the Whitehorse without Newgate. While little of Overton's cartographic work was original, he did fill an important gap by republishing the work of various influential cartographers of the previous generation. Overton acquired the map plates of Peter Stent, who died of the Plague in 1665, and published his first atlas around 1670. In 1700 he acquired, from Christopher Brown, the map plates originally produced for the John Speed firm. John passed his business to his sons, Henry Overton (fl. 1707 - 1749) and Philip Overton (17?? - 1751), in 1707, one year prior to his death. Henry republished John Speed's great atlas in 1713 and again in 1743. Philip Overton went on to partner with Robert Sayer (1725 - 1794) acquiring the map plates of John Senex and opening a shop at Ye Sign of ye Golden Buck by ye Mitre Inn. Very good condition. Map has been professionally flattened and backed with archival tissue. Extremely minor loss, bottom center, in Dorsetshire. Shirley, R., Maps in the atlases of the British Library, Visscher 2 , State 4 of 5.